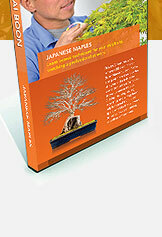 Boon starts this DVD by introducing you to two Japanese Maples from the nursery and takes you step-by-step through the techniques. In fall, Boon does the initial work on the trees. He removes the leaves, cuts and prunes. He also discusses what he sees as the future for the trees. In late winter, he repots the tree. In early summer, Boon shows the results of repotting and then prunes and wires the tree. In fall, one year from starting, he removes the leaves, prunes and wires. Finally in spring, Boon ends then DVD after 18 months of work. There is also a section that shows techniques for refined trees. Following the techniques Boon demonstrates on this DVD will help you promote new growth and establish a healthy bonsai. a free download from Apple.